I can't quite remember when this music plays, but it's probably when you're being threatened by Mr. Fossey, first mate of the Sea Cucumber (I'm not kidding, that's the name of the ship). 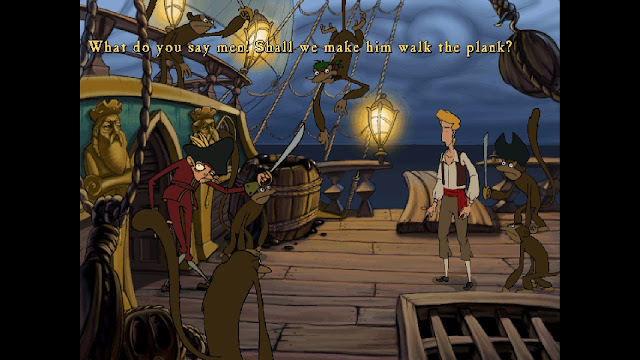 If you played The Curse of Monkey Island, you'll know that Mr. Fossey isn't quite all there, however, he does manage to steal Elaine (in golden statue form) intent on selling her to fund an entire fleet of ships so he can become the scourge of the Seven Seas, or something. Guess that makes him a megalomaniac too. Anyway, you get to hear more of that funky reggae, which is a good thing, right?